Before coming to the Smithsonian, Lopez was already an aviation legend: a fighter pilot in the 23rd Fighter Group of the 14th Air Force –successors of the legendary Flying Tigers­ in China. He flew Curtiss P-40s and North American P-51 Mustangs, demonstrating his extraordinary flying skills under the leadership of famous war heroes Col. Tex Hill and Gen. Claire Chennault. During his two years in China, Lopez flew 101 missions and tallied up five victories, the required number to be recognized as an “Ace. 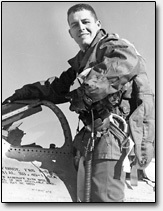 Lopez was a member of the American Fighter Aces Association, the Experimental Aircraft Association and is a Fellow of the Royal Aeronautical Society. In 1995, the National Aeronautic Association named him an Elder Statesman of Aviation, and in 1999 he was presented the Federal Hispanic Heritage Month Excellence in Leadership Award. He was also a recipient of the Frank G. Brewer Trophy in Museum Education. Lopez was honored in 2007 as one of the living legends at the Gathering of Mustangs and Legends at Rickenbacker Field in Columbus, Ohio.